The New Zealand Ice Cream Manufacturers' Association (Inc.) (NZICMA) represents New Zealand's manufacturing ice cream industry. Membership is made up of Manufacturers and also Associate Members, who are suppliers of products and services to the ice cream industry. The NZICMA also has Life Members who have all been long standing members and contributed significantly to the Association. See the Member Companies page for a full list of our members. The NZICMA maintains an Executive Office in Wellington to carry out administrative functions, represent the industry to Government and Food Standards Australia New Zealand (FSANZ), and to provide a liaison with associated industries and organisations. The NZICMA is also a member of the Food Industry Forum and the Dairy Product Safety Advisory Council (DPSAC). The Association holds an annual Conference, and runs the annual New Zealand Ice Cream Awards in conjunction with the annual Conference. The Association operates Executive and Technical committees to address membership and industry issues. Annual Conference: The NZICMA holds its members' conference and AGM once a year, at venues rotating around the country. The Association's 2018 (91st!) Annual Conference and AGM was held in Auckland on 30th and 31st of May. New Zealand Ice Cream Awards: The New Zealand Ice Cream Awards have in the past been held in conjunction with the NZICMA Annual Conference each year, with Awards presentations taking place at the Conference Dinner on the Thursday evening. RESULTS from the 2018 New Zealand Ice Cream Awards. Industry standards: The NZICMA played an important role in the development of the Guidelines for the development of a Food Safety Programme or a Risk Management Programme for Ice Cream (previously known as the Code of Practice for the manufacture and supply of ice cream), put together by a Working Group with input from MPI (NZFSA), MoH, FSANZ and the ice cream industry. As of December 2012, the Guidelines ... for Ice Cream document is now administered by the NZICMA. These Guidelines are an important step forward in the application of modern techniques to the management of food safety. The NZICMA has commissioned Shona McCahon, an oral historian, to record a series of interviews with ice cream industry identities, to capture some of the fascinating history, photos, memories and memorabilia. The Association has also produced a written History of Ice Cream in New Zealand, and published it here on this website. Personal and public collections and newspaper archives have been supplemented by material from the NZICMA's own archives, including issues of its trade journal, The Frostee Digest, published from 1941 to 1972. In January 1866, Mr James Osgood, proprietor of the Empire Hotel in Wellington, proudly announced the arrival of ice, imported all the way from Wenham Lake, Massachusetts, USA, allowing him to offer ice cream on his lunch menu. Photo: Ice cream carton, Crystal Ice Co Ltd, Dunedin. From the collection of Owaka Museum Wahi Kahuika The Meeting Place "a rest on your journey". The New Zealand Ice Cream Manufacturers Association was incorporated in 1927 - first members at that first meeting were W.A. Fisher, Frozen Products, Wellington; P.H. Ferguson, Robinson Ice Cream Co., Auckland; and H. Turner, Crystal Ice Cream, Dunedin. The first Chairman and President was H. Turner. Pen Moore, who was Executive Secretary of the NZICMA for 50 years , retired from his position at the 76th Annual General Meeting and Conference held in Invercargill, June 2003. A vote of thanks was given to Pen by Ray O'Connor of Tip Top Ice Cream for his service and dedication to the Ice Cream Association and industry over that period. The Association presented Pen with a painting depicting Durville (the French Explorer) on his voyage to the Antartic, painted by his official artist on board. 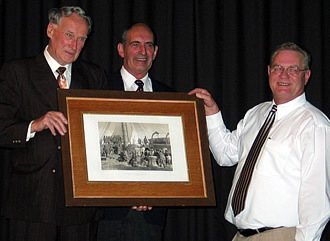 Photo: Pen, left, is presented with his painting by Brian Simon and John Murphy, on behalf of the Association. (2009) Murray Taylor was President of the Association from 1984-1986, and a long-standing member and chairman of the Technical Committee. Murray was responsible for developing the Ice Cream Industry’s own Code of Practice, and has contributed enormously to the research and development of the New Zealand ice cream industry. He is often called “Mister Ice Cream”. Murray was Managing Director of New American Ice Cream, MD of United Dairy Foods, then Technical Manager for Fonterra Brands (Tip Top). He is currently a Director of OOB Ice Cream Ltd and involved with manufacturing organic ice cream. (2004) Life membership was conferred on John Murphy for his tremendous efforts and contribution to the industry through a difficult time affecting the survival of the Association and industry. John had been President for two terms (1994-1998) so he could finalise the harmonisation of Ice Cream Standards with the New Zealand Government and Australian Authorities. He was also instrumental in implementing the first New Zealand Ice Cream Awards competition. John owned New Zealand Ice Cream Company Ltd, formerly Mel-O-Rich Products Ltd, which was based in Wellington. 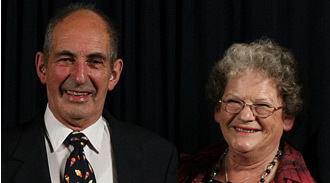 (2003) Brian and Jeanette Simon were awarded Life Membership for their long association and contribution to the industry. Their company, Deep South Ltd, operated plants in Invercargill and in Christchurch, the only manufacturer, besides Tip Top, with two plants. Brian's father was also an ice cream manufacturer and Brian joined the family business, Newjoy Ice Cream in Dunedin, at 15 and worked there for 10 years. He then went farming for a few years and in 1963, with his wife Jeanette, founded the Manda Ice Cream Company in Invercargill which in 1979 became the Deep South Ice Cream Company. Brian was President of the Association from 1986-1988. (1995) Pen Moore was appointed Executive Secretary of the NZICMA in 1953, and was awarded life membership for his service and dedication to the Ice Cream Association and industry. Pen retired from his position at the 76th Annual General Meeting and Conference held in Invercargill, June 2003, after 50 years of service. (1992) Owen Norton, of Westland Snowflake Ice Cream Ltd in Greymouth, had worked continuously for the Association for over 30 years, and had been a very valuable ally of the industry. At one stage, when the Association was in peril of dissolving, Owen, together with Bob Fyfe, was responsible for ensuring the Association continued to exist. Owen was President of the Association from 1972-1977. (1983) After 25 years of dedicated service to the industry Bob Fyfe was awarded Life Membership. The strength of the Association owed much to Bob's interest and dedication, and his consideration and understanding of the problems of all manufacturers irrespective of their size. Bob had been a member of General Foods Corporation (NZ) Ltd and was President of the Association from 1979-1982. 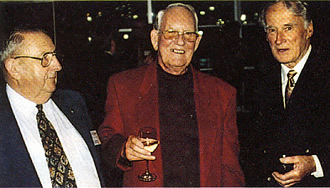 Photo: Three Life Members, Owen Norton, Bob Fyfe and Pen Moore, together at the 2002 NZICMA Conference dinner.